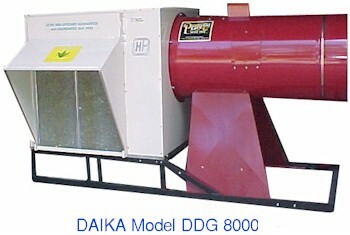 The Daika Model DDG 8000 is specifically designed for drying peanuts and seeds. It takes humidity out of the drying air and uses a heat pump cycle to generate drying heat. Drying is faster with very low energy cost in the warm, humid summer environment. The DDG 8000 dryer has a regular LPG back-up burner attached to supplement heat when needed. During the drying season, about 80% of the drying can be done using the economical heat pump. The remaining 20% drying in cold days may need the use of back-up propane. In drying farm products such as rice, grass seeds and peanut, the Daika dryers typically save the farmers 30% of their energy bill and reduce drying time 50%.